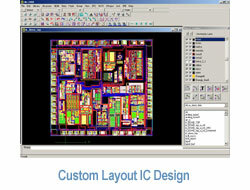 For creating customized layout for your analog or mixed-signal IC, you want a highly flexible CAD tool, that makes no compromise on quality, that provides all the features you expect and that has been proven through years of successful use. And most important, that makes you as productive as you can be. dw-2000� Layout Editor is the solution to your physical layout needs. 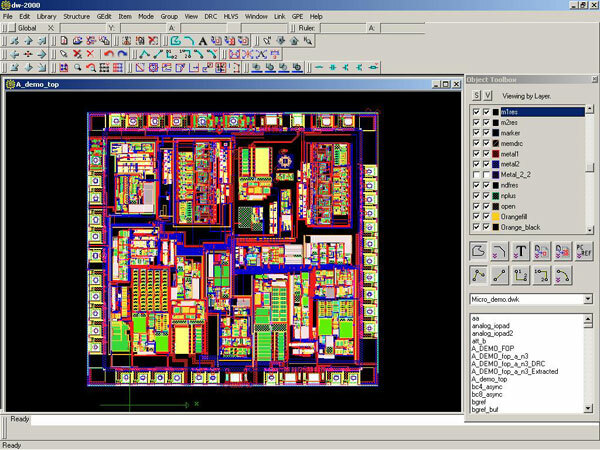 Layout Editor, which is the core dw-2000 module, is used for creating layouts aimed at mask manufacturing. It is a powerful tool that includes all the functionality required for custom layout, at an affordable price, which makes it possible for every engineer to have his or her own desktop tool. It provides a fully integrated and customizable environment for physical layout and verification. And its superior performance, along with features required by experienced designers, places it in a class of its own. The easy to use and learn interface of Layout Editor reduces the learning curve and allows designers to become productive quickly. The ability to customize the interface reduces the learning curve further because it allows users to tailor the tool according to their needs and preferences. Parameter cells (p-cells) provide the ability to automatically generate device layouts based on user-defined parameters. The GPE scripting language is easy to use, which allows designers to quickly define their own user specific p-cells. Layout Editor is part of the dw-2000 tool suite. Click here for more information on the dw-2000 packaging.